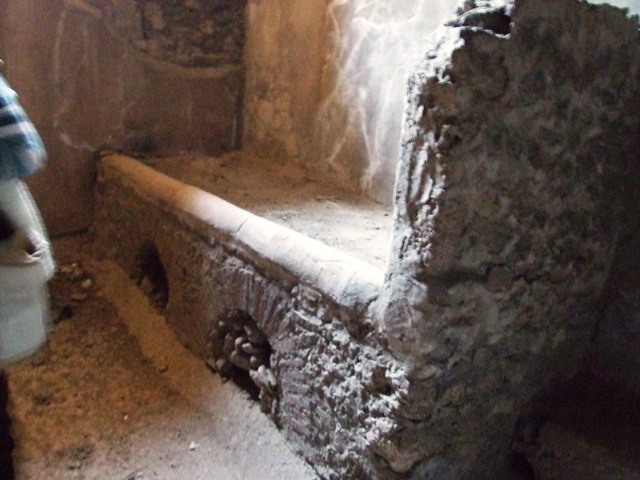 VII.16.22 Pompeii. 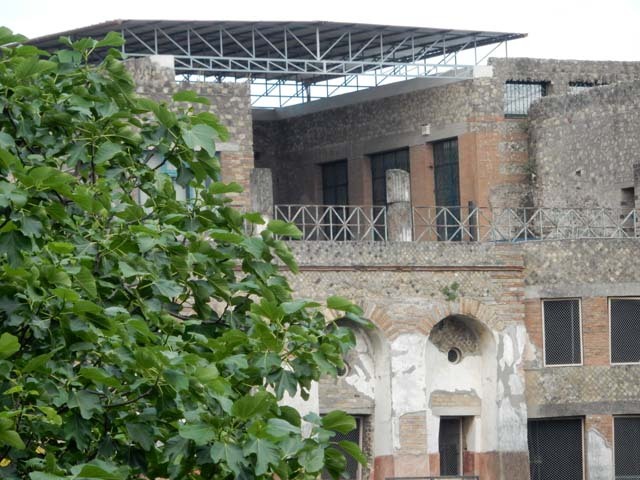 Casa di Fabio Rufo or House of M Fabius Rufus. Linked to VII.16.17, VII.16.20 and VII.16.21. Shown as number 19 on Eschebach site plan. Excavated 1759, 1910, 1940, 1958-1980. Looking east from rear towards the upper terrace, the lower hanging garden area below, and the garden area, at its base. Photo courtesy of Buzz Ferebee. 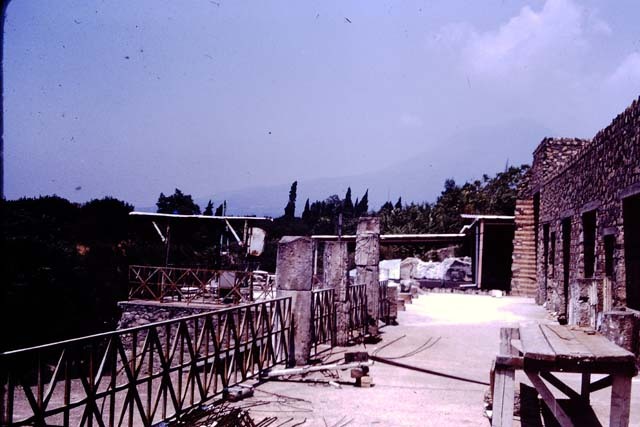 VII.16.17-22 Pompeii, 1978. 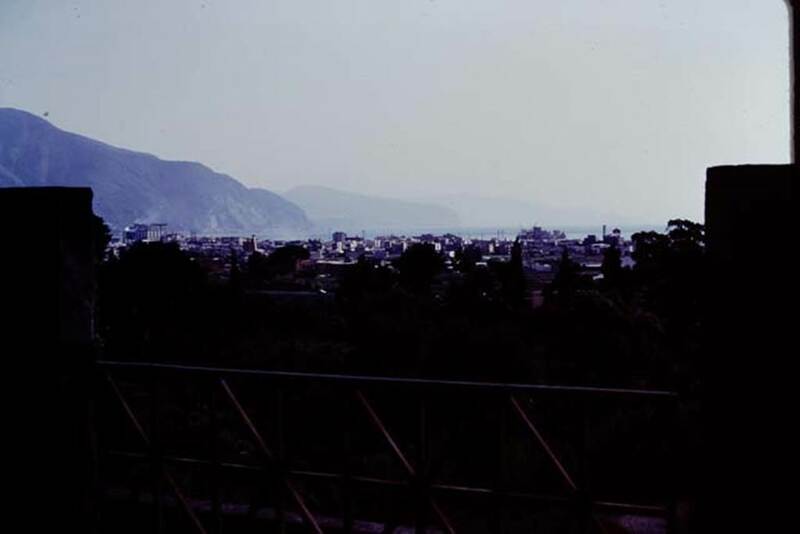 Looking west towards the Bay, and Sorrentine peninsula from the upper terrace. VII.16.17-22 Pompeii. September 2004. Looking south-west across portico of upper terrace. 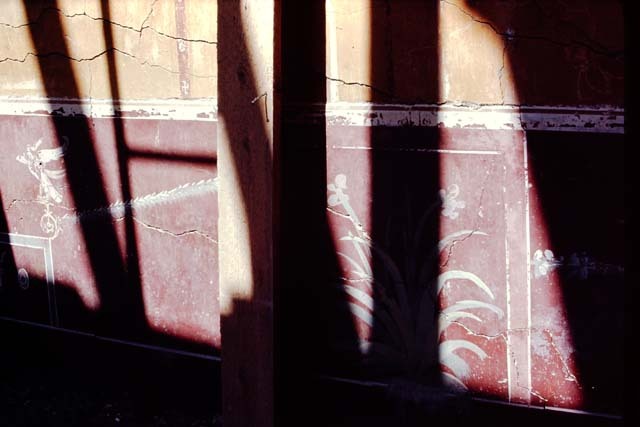 VII.16.17-22 Pompeii. 1977. Looking south across portico of upper terrace. Photo by Stanley A. Jashemski. VII.16.17-22 Pompeii. 1972. Looking south-west across portico of upper terrace. Photo by Stanley A. Jashemski. VII.16.17-22 Pompeii. May 2015. Looking east from rear towards the lower hanging garden area, with the upper terrace above. 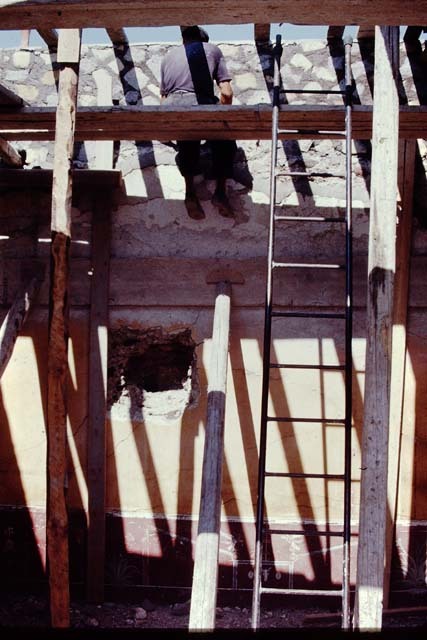 VII.16.17-22 Pompeii, 1980. Looking south along the rear towards VII.16.17, on right. Photo by Stanley A. Jashemski. VII.16.17-22 Pompeii. 1980. Looking south down onto hanging garden area with pool. VII.16.17-22 Pompeii. 1977. Looking south-east across upper terrace portico, and down to lower levels. VII.16.17-22 Pompeii. May 2015. 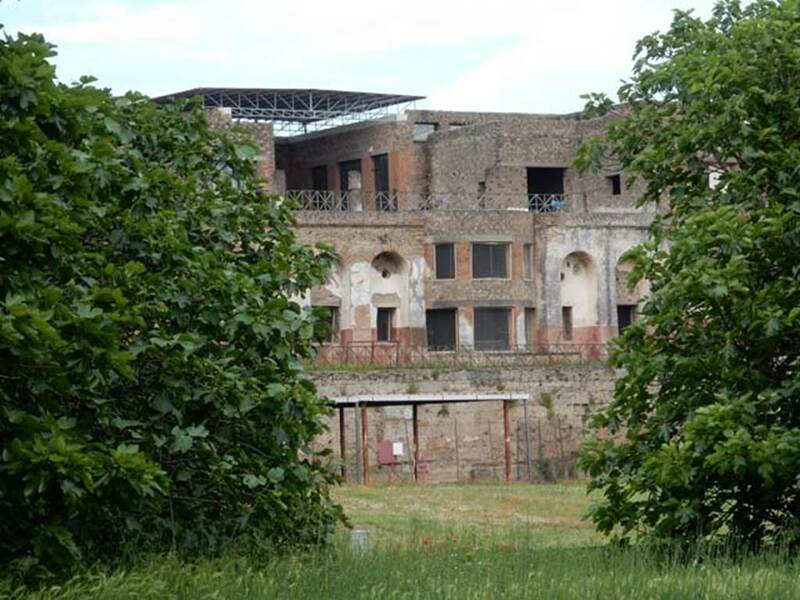 Looking east from rear towards the upper terrace and the area of the stately oecus. VII.16.17-22 Pompeii. 1977. 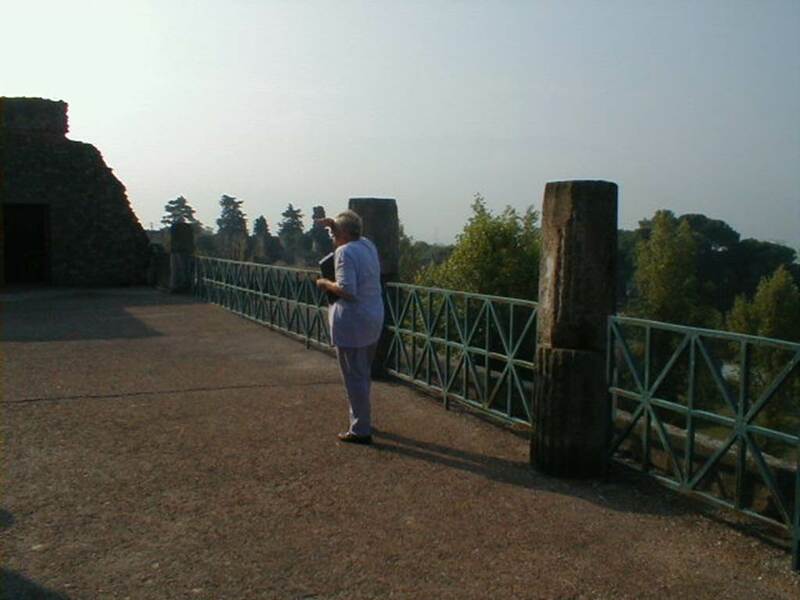 Looking north-west across upper terrace portico, from the area of the stately oecus. VII.16.17-22 Pompeii. 1977. 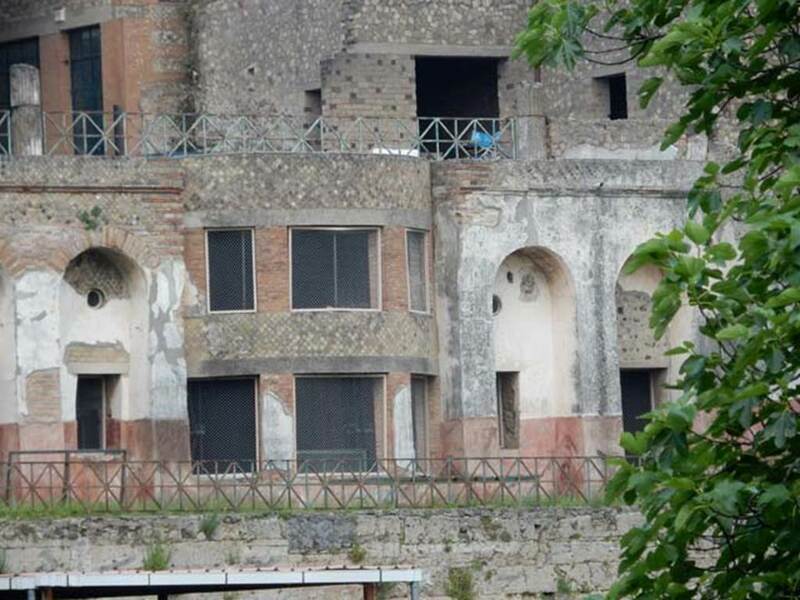 Looking north along upper terrace portico, towards the House of the Golden Bracelet (VI.17.41-42). 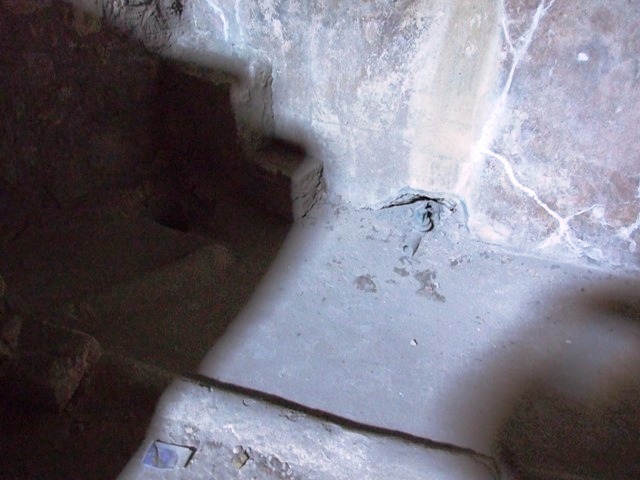 The doorway to room 17 can be seen on the right. Photo by Stanley A. Jashemski. 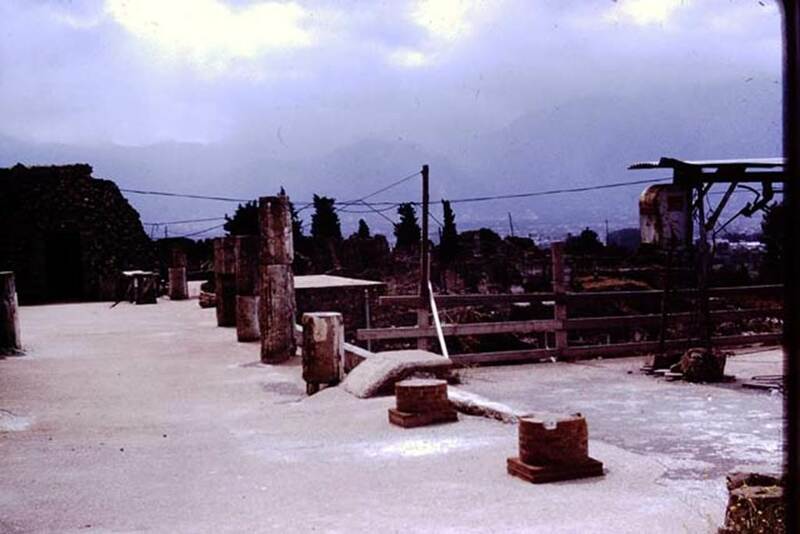 VII.16.22 Pompeii, 1968. 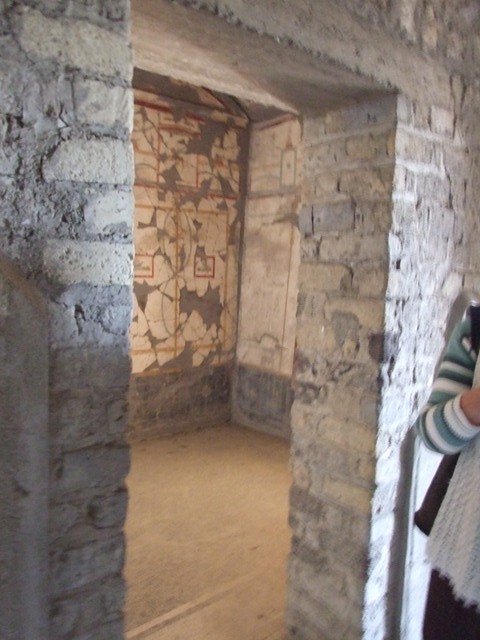 Room 17, east wall, during consolidation. 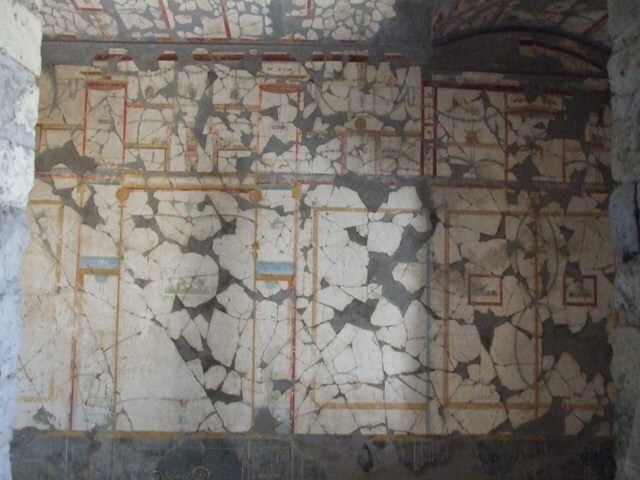 According to PPM, this painted wall was from the triclinium of I.14.5. 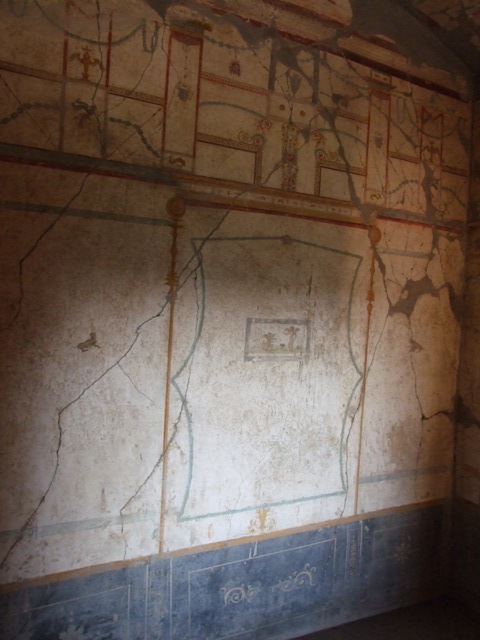 According to Grimaldi, the east wall of room 17 was decorated in the IVth style. See Grimaldi M., 2014. 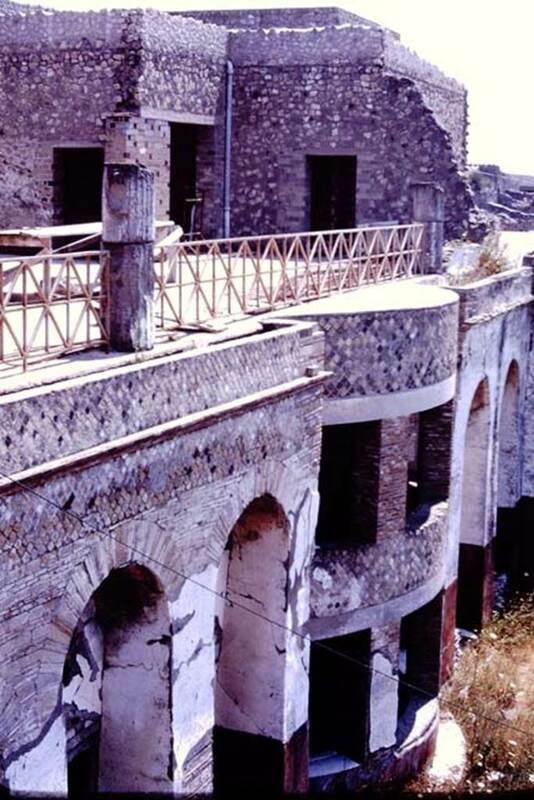 Pompei Vol. 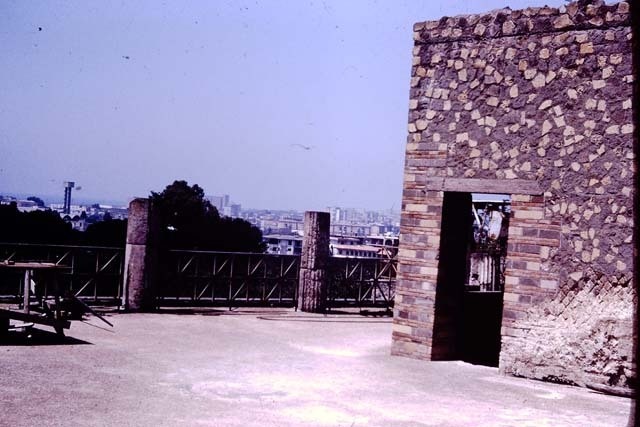 II: La casa di Marco Fabio Rufo. Napoli: Valtrend, p. 106. 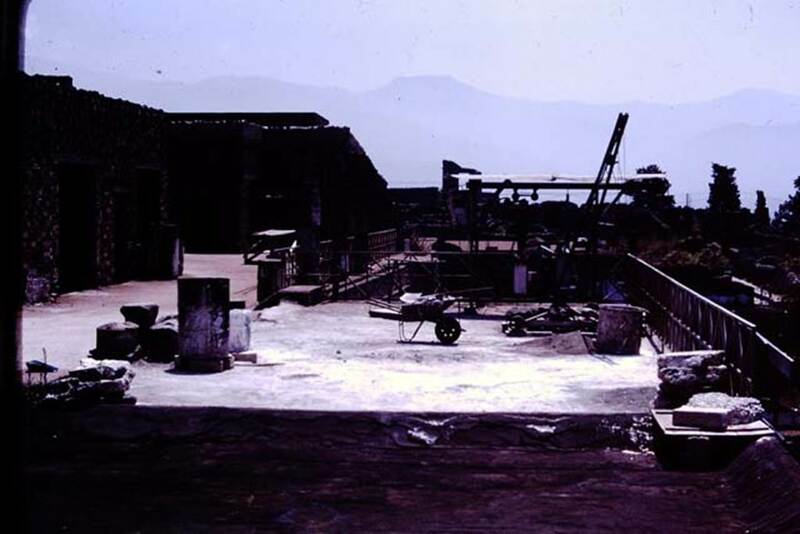 VII.16.22 Pompeii, 1968. 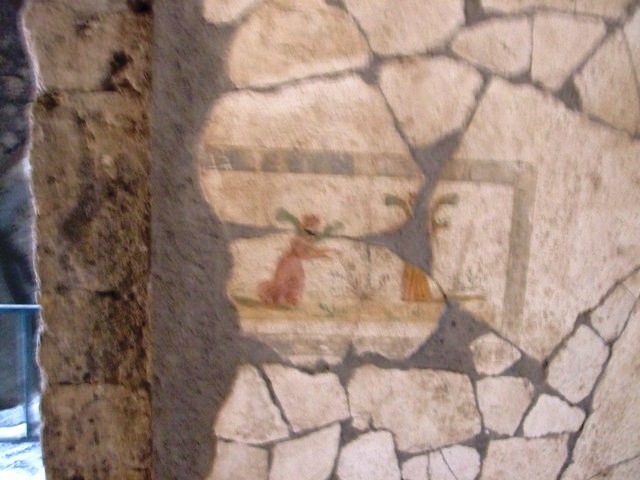 Room 17, detail of zoccolo on east wall. Photo by Stanley A. Jashemski. VII.16.17-22 Pompeii. December 2007. 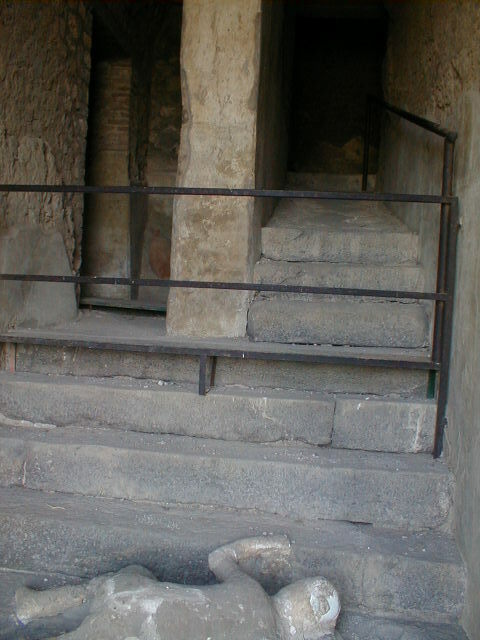 Staircase to lower levels. VII.16.17-22 Pompeii. December 2007. 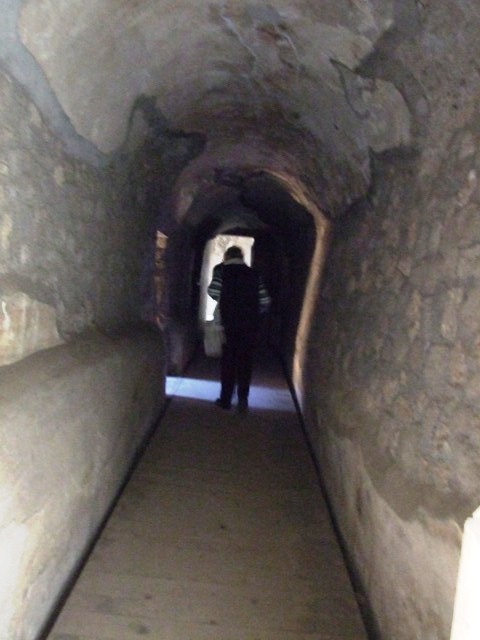 Lower level corridors. VII.16.17-22 Pompeii. December 2007. 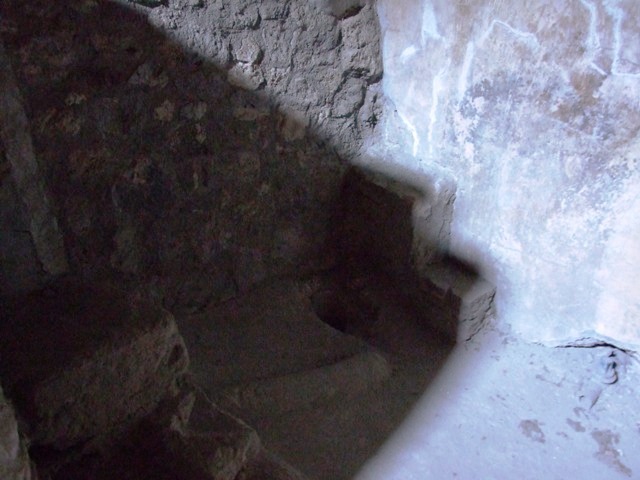 Staircase from lower level. VII.16.17-22 Pompeii. December 2007. Looking out from staircase, onto a garden area. 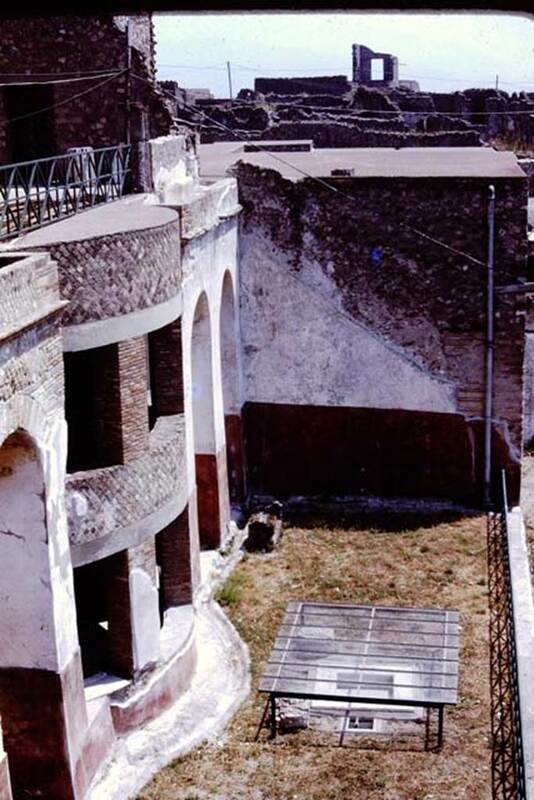 According to Jashemski, this garden area was a long hanging garden, created by placing soil on the roof of the rooms below. 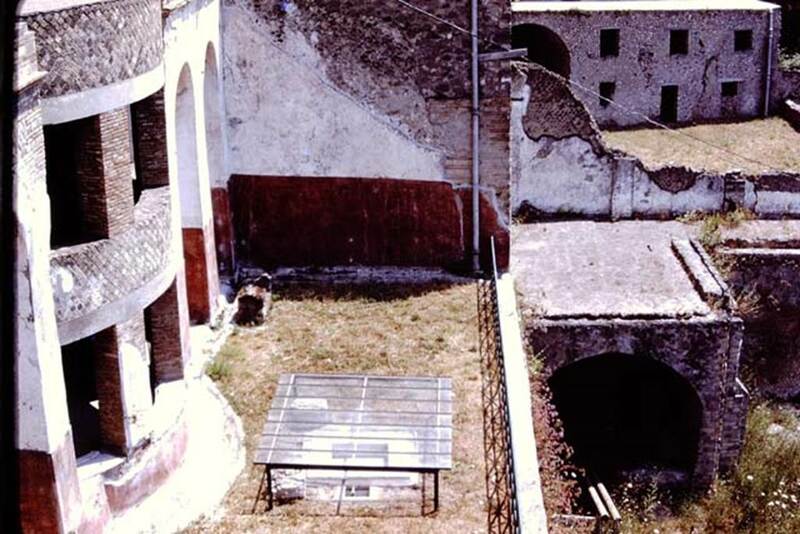 A small marble pool, edged with a marble border, was located in front of the windows of the important oecus with a bay window, which faced the garden. VII.16.17-22 Pompeii. December 2007. Looking down the stairs towards a plaster cast of body lying at foot of staircase. 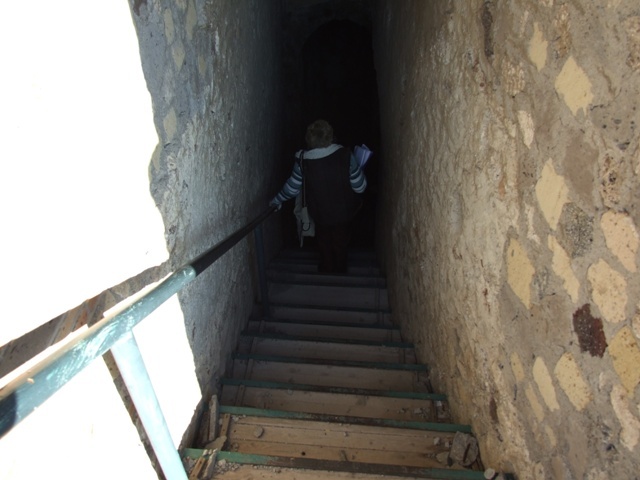 Four people met their death in this house, three of them died huddled together on this staircase. They were discovered in November 1961. It was possible to make casts of the group of three. 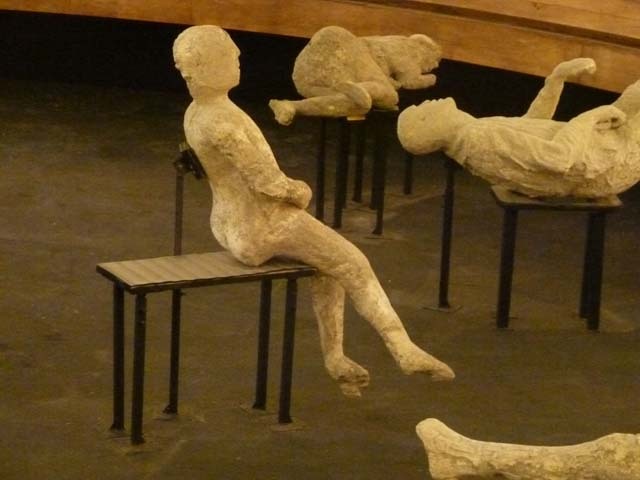 A copy of the plaster cast of the lowest of the three bodies remains where it was discovered. The fourth skeleton was lying on the landing at the bottom of the stairs but only a photo remains of this skeleton. 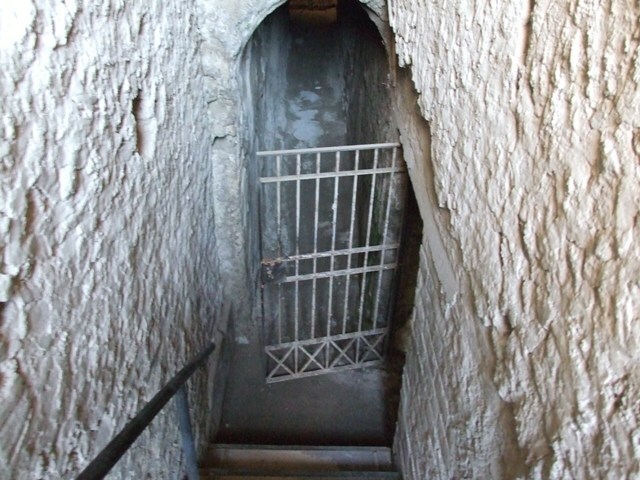 Looking up towards the stairs where a group of fugitives were found, and where one still lies at the foot of staircase. VII.16.17-22 Pompeii. September 2015. Exhibit from the Summer 2015 exhibition in the amphitheatre. 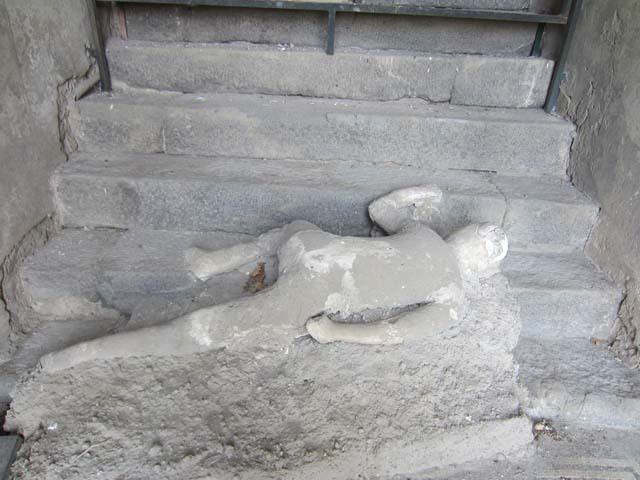 Plaster cast of a body found huddled together with the others on the stairs that led to the ground floor. 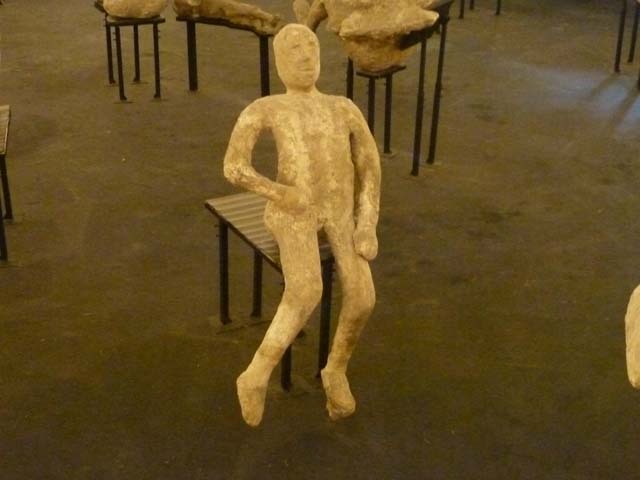 Plaster cast of a body, on left, found huddled together with the others on the stairs that led to the ground floor. VII.16.17-22 Pompeii. May 2006. 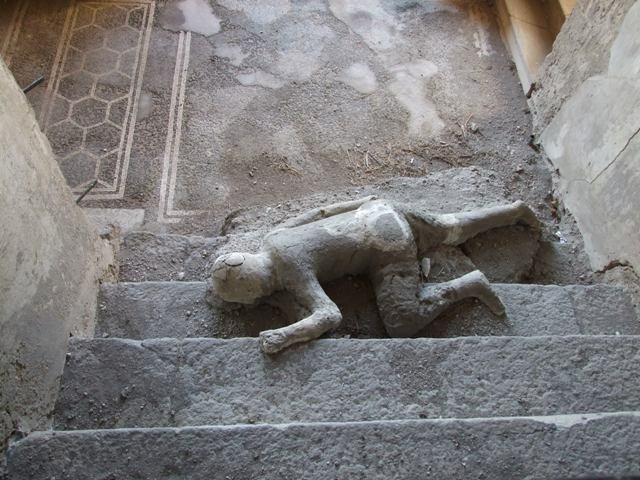 Plaster cast of body lying at foot of staircase. VII.16.17-22 Pompeii. May 2012. 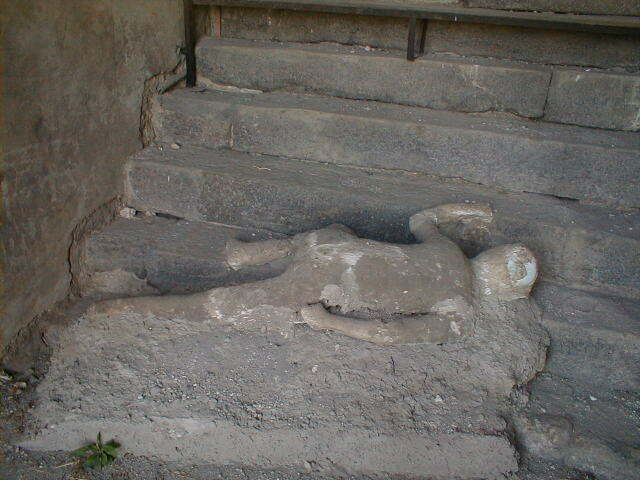 Plaster cast of body lying at foot of staircase. Photo courtesy of Marina Fuxa. VII.16.17-22 Pompeii. December 2007. 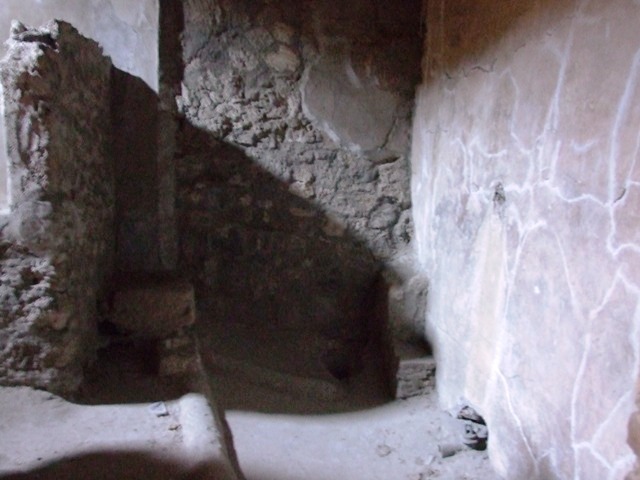 Latrine in kitchen. VII.16.17-22 Pompeii. December 2007. 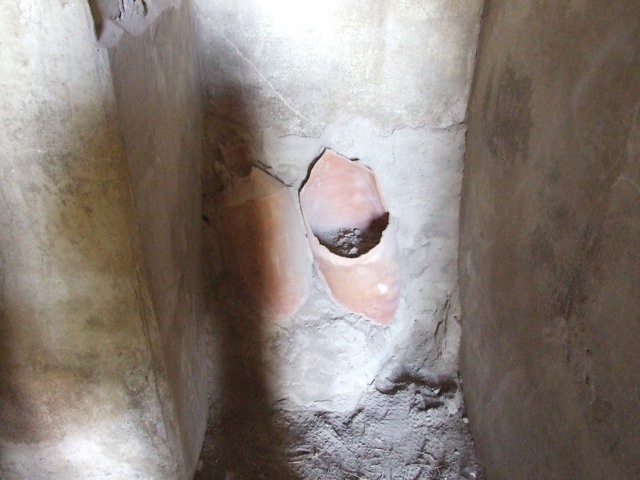 Latrine with water valve. VII.16.17-22 Pompeii. December 2007. Kitchen. VII.16.17-22 Pompeii. December 2007. 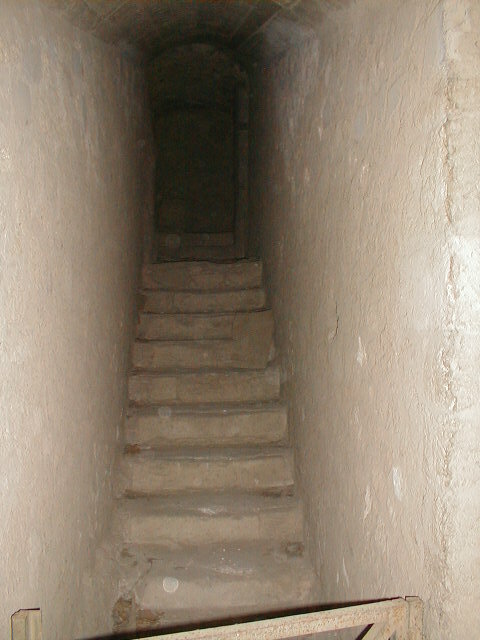 Corridor. VII.16.17-22 Pompeii. December 2007. 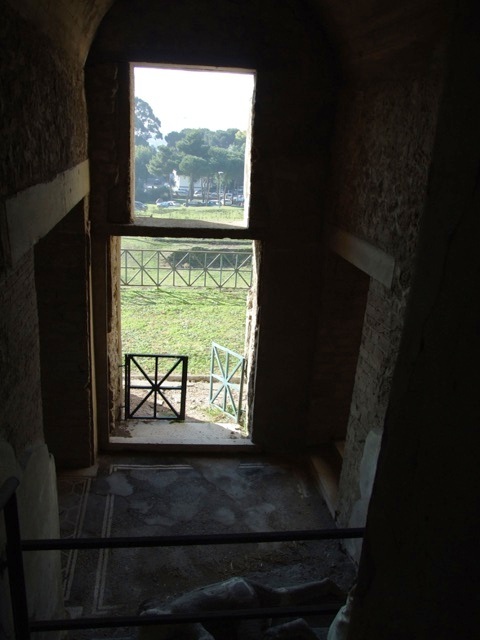 Doorway to cubiculum. VII.16.17-22 Pompeii. December 2007. IV style decoration on white background on east wall of cubiculum. VII.16.17-22 Pompeii. December 2007. 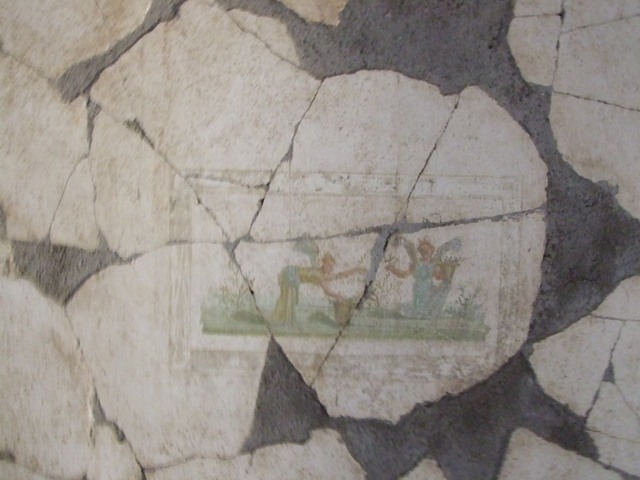 Detail of painted wall panel of cupids from centre of east wall. VII.16.17-22 Pompeii. December 2007. South wall of cubiculum. VII.16.17-22 Pompeii. December 2007. 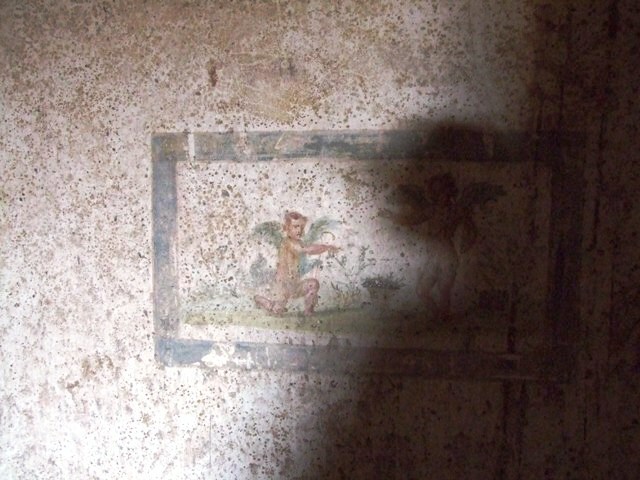 Detail of painted wall panel of cupids picking grapes from south wall. VII.16.17-22 Pompeii. December 2007. Detail of painted wall panel from north wall, east side of doorway. VII.16.17-22 Pompeii. December 2007. 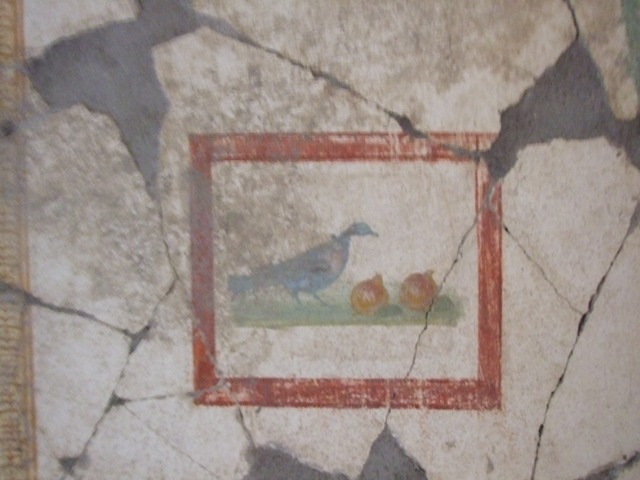 Painted wall panel of bird and figs, from west end of south wall in alcove in cubiculum. VII.16.17-22 Pompeii. December 2007. 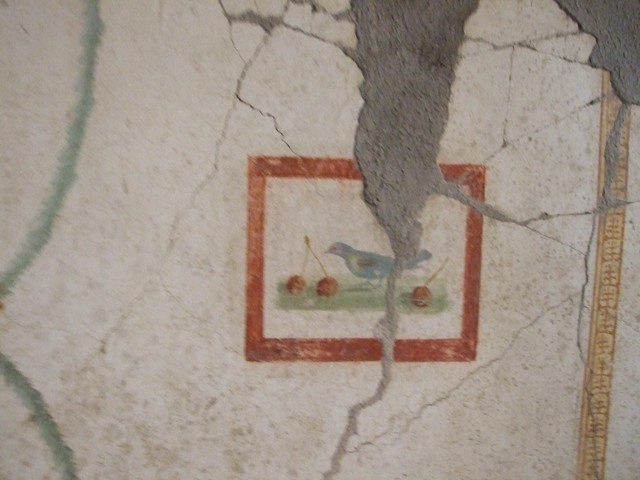 Painted wall panel of bird and cherries from west end of south wall in alcove in cubiculum. VII.16.17-22 Pompeii. December 2007. 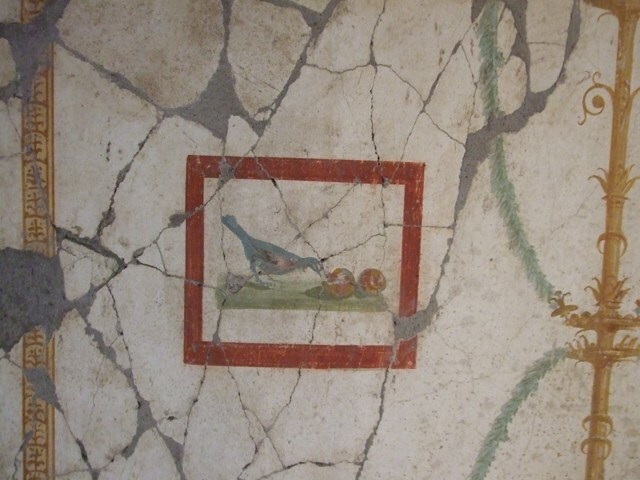 Painted wall panel of bird and figs, from east end of north wall in alcove in cubiculum. VII.16.17-22 Pompeii. December 2007. 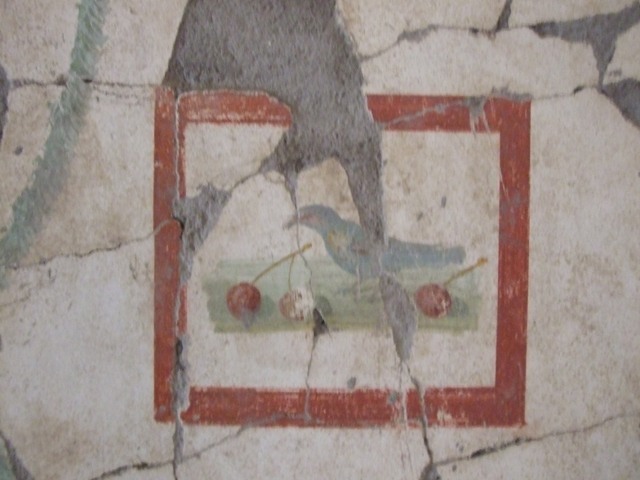 Painted wall panel of bird and cherries, from east end of north wall in alcove in cubiculum.